I have promised to review this game, so here I am. I really thought I had reviewed this game last year. But it turns out I was mistaken. 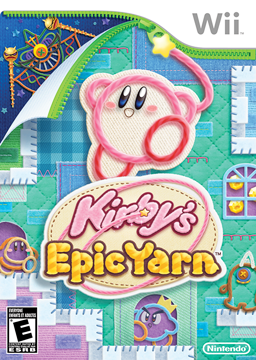 In any case, let’s talk about Kirby Epic Yarn. The first game in the “Epic Yarn” series. I have beaten this game quite a while ago, so I have replayed a few levels to remind myself how the game played. So, I hope you are ready to dive into the wooly world of this game. I have played this game on the Wii and almost 100%’ed it. For those who are curious, why I called this game a part in a series is because two years ago, Nintendo released a spiritual successor to this game called Yoshi Wooly World. I haven’t played enough of that game in order to write about it. But hey, I’m getting off topic. Back to reviewing this Kirby game. And as usual, feel free to leave a comment with your opinion on the game and/or the content of this article. Wool, wool and wool everywhere! In this game, Kirby is having a peaceful day in Dreamland, when suddenly; the fire nation attacks. Oh, sorry. Wrong game. I meant, an evil wool named Yin-Yarn wizard attacked. After Kirby has eaten a tomato that was possessed by that Yin-Yarn, the evil wizard uses his interdimensional sock to transport Kirby to Patch Land where his adventure starts. But Yin-Yarn wants to take over the world (of course!) and possesses Meta Knight and King Dedede. This way, Yin-Yarn tries to take over DreamLand, Kirby’s homeland. Surprisingly, there is a narrator in this game. Usually, in Kirby games, everything is told through text boxes. There is only one voice though. That’s the one of the narrator. As is tradition in these kind of platformers, the story tacks a backseat during gameplay. Apart from some cutscenes between sections, the story isn’t that present. While I prefer deep an interesting stories in my games, this was a welcome change of pace. It was relaxing to play a game with a light story and more focus on gameplay. While this game supports a two player option, I haven’t played it much. So, I can’t review that mode. So, in this review I’ll only focus on the single player mode. If you are looking for a traditional Kirby game, this game isn’t it. In this game, you can’t use Kirby’s copy ability. This game is centered on the wool mechanic. 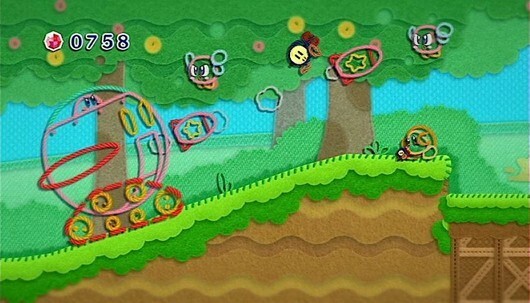 In some levels, Kirby can transform in various vehicles. But how that works, I’ll leave as a surprise if you still want to play the game. This game is a platformer. Yet, in some areas you need to think outside the box. 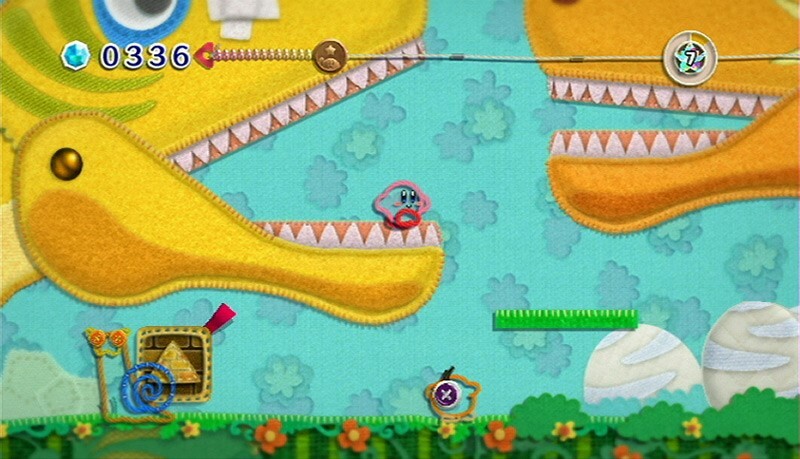 Since Kirby doesn’t really have his float ability in this game, you need to jump over all gaps. And some gaps are very wide. So, you need to find a way to get into the background to move over the gap or use your new wool abilities to pull the other side closer to you. It’s hard to explain in just text, but when you look at some screenshots, it will explain itself. In this game, you can’t die. The challenge in this game is in the collection of gems in each level. At the end of each level you get evaluated by the amount of gems collected. You can earn a bronze, silver or gold medals. But completionists, beware! This game hasn’t a completion bonus. But, it can keep you busy for a while since trying to earn a gold medal in each level can be difficult and finding each collectable isn’t an easy task either. The collectables are extras like movies and the soundtrack. The wool mechanic is used in very creative ways. Like I said before, it’s used to “rip” the world. And not only that, the game is presented beautifully. The wool theme is present throughout the whole game and it looks amazing. It’s colorful and relaxing. When I was playing this game, I felt in a relaxed state. This was a game to wind down. Overall, this game isn’t very hard for a more veteran player. If you aren’t a stranger to this game, you won’t have a lot of trouble with this game. There is one minor issue with this. I wasn’t able to play this game in long sessions. After an hour or two, I usually stopped playing this game. I got bored. This might be a personal issue… Since I had a great time with this game. The music in this game is amazing. It’s amusing to see that Nintendo labeled the soundtrack CD of this game as the “Epic Soundtrack” like the title “Epic Yarn”. When I was playing this game I saw the soundtrack to this game as my most favorite Kirby soundtrack ever made. Now-a-days that title has been taken by the more recent 3DS games. But that doesn’t take away the fact that the soundtrack is amazing. The sound design of this game helps a lot with the atmosphere. It adds to the design of the game and I have no complaints. Sometimes I even felt that the game almost came alive. Now, let’s talk about the menus and the UI. And honestly, I didn’t have any problems with it. This game works perfectly on the Wii. I have no issues about the UI. One thing I would have changed was that the menu and the area select menu were integrated into one menu, but that putting it into two different menus works just fine. The controls of this game are perfect. I have played this game with the WiiMotion Plus and I barely had any problems. Again, I have no complaints about it. The mini-games are a lot of fun when you have some time to mess around. They don’t add a lot to the main game. This game has a rather decent length. 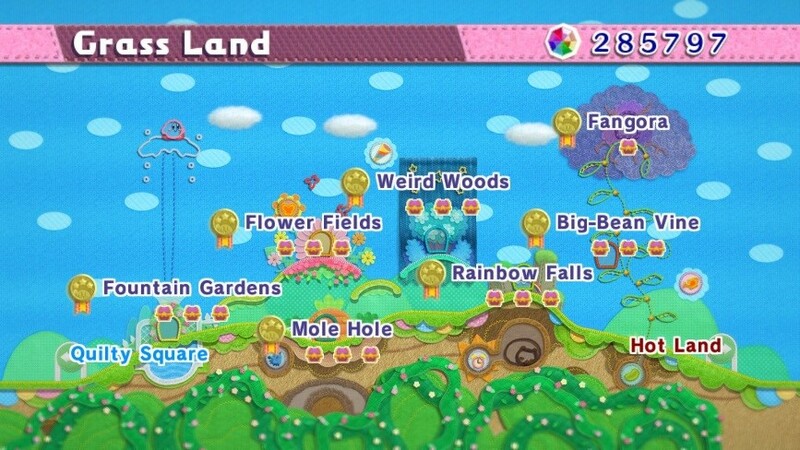 This game has 8 worlds with a variable amount of levels. So, no complaints here. Well, so far you would think that this game doesn’t have any flaws. But, there are some things I didn’t like about this game. It’s nitpicking but… I found that some moments of the narrator weren’t that good. They felt forced or too much focused on a very young audience. There is one thing that got underused. And that’s the decoration of your own apartment. I wish you could do more decorating. And honestly, that’s about all that I can say bad about this game. When you like to play charming platformers, you can’t go wrong with this one! So, the pink thread ends here. Because I have said everything I wanted to say about this game. So, it’s time to make the summary of this article, for those who are just looking for a quick review of this game. Sometimes mixed performance of the narrator. The apartment is very underused. This game is one of the best games I have played on the Wii. This game deserves its spot on various top 10 Wii games list. It got 8th place on my list. While the visuals might turn some people down, for those who give it a try are in for a very relaxing and enjoyable game. This game has a lot of polish by the developers and a lot of love was put into it. And it shows. I loved to play this game and I hope that this review might win over some people who haven’t tried it. 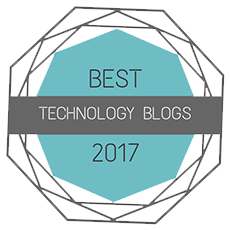 In any case, thank you for reading my review and I hope you enjoyed reading it as much as I enjoyed writing it. I hope to welcome you in another article on my blog but until then; have a great rest of your day and take care! This entry was posted in Articles, Reviews and tagged 001, arpegi, best, cute, epic, ever, FeelGood, game, gameplay, GoodFeel, Hall, information, jea, Jonez, jonez001, jonezjea, kirby, laboratory, made, minigames, more, neko, Nintendo, Platformer, Preview, review, tags, two player, walkthrough, wii, Wii U, Wooly, world, yarn, Yoshi on July 8, 2016 by NekoJonez.